The first time my life changed when I bought my Commodore 64 in 1983. I went to our super market similar like Walmart to buy this $600 expensive computer with no hard drive or floppy disk. I went home and wrote my first program. A Zip Code translator. I could input a Zip Code and got the city back and vice versa. Of course it was only for West Germany. I wrote the program in basic and had to leave my computer on otherwise I would lose the data. Unfortunately after two weeks my mom needed to vacuum my room. She unplugged the computer and I lost everything. I had to buy me a floppy disk and an Epson FX 80 printer. I did spend all my savings for this. 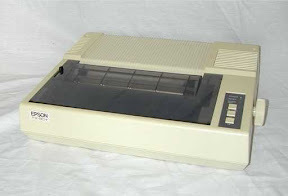 I think it was over $1500 for printer and floppy. The monitor I used was my 15 inch TV. I had fun and learned a lot in this time. From this time one I had always a computer and used it every day. From Commodore I went to Atari and from Atari to Apple. I never had a Windows computer at this time. Till I started at the university in 1990. I had to buy a PC, because the software I needed was not available for Apple in the time back, and all my student friends had PCs and word for DOS. It was the only way for me to share and exchange documents. There was no Facebook or real Internet yet. But we used since the mid 80 our acoustic coupler to connect to other computers to download data or to chat and later in the early 90 we used AOL. From 1990 on I started to love PCs and Windows. Windows 3.1 was awesome (I thought). My oldest friend was still on Atari but only because Apple was so expensive otherwise he would have had Apple. Later on we both started an agency in 1994 to build websites, catalogs and print ads. We chose Atari because of Calamus a desktop publishing software. And then we went to Apple and Quark Express and photoshop. But in my heart I was still a PC fan. I actually had till 2004 always discussion with my friend about which system is better. In 2004 I moved to America and decided to buy an iPod. From this time on Apple changed my life. Apple did convert me with a simple product. The iPod was great but I needed iTunes and iTunes was just released for Windows and did not work well on my old computer. I needed a new one and decided to go with the iMac. I gave the iMac a chance and it was a great. Finally an all in one computer which was good priced and pretty fast and stable. I had this computer till January 2010 when I bought me the new iMac. During these 6 years I bought a MacBook Pro, multiple iPods, Apple TVs (first and second generation), each iPhone version and both iPads, airport extreme and time machine. My friend even skipped some iPhones and has no iPad. He, the big Apple fan, has now less Apple gadgets than me. Everything I have in private is build around iTunes. iTunes is just a music program but the epic center of my devices. One of the smartest moves Apple ever did. With iTunes they were able to bind their customers. Which today would make it harder for me to switch because of iTunes. But Apple changed my life again. Just 12 months ago with the iPad. Before I believed in surfing the web to get my information. I believed everything will be based around web browsers. Like many companies I believed the future is in web application accessible through browsers. But Apple changed it and my thinking. Today I use the web browser only for searching specific things or if there is not an app available for the iPad. Otherwise i use apps on the iPad. Apple understood that browsers are taking a lot of usability away because what ever we want to build as web application must work on many different OS, screen size and browsers. Therefore they came up with the app concept. Why not building apps which are optimized to screen and hardware. And have the apps simple enough to sell them mostly under $10. Today we have over 300k applications for the iPhone and over 60k for the iPad available. I even don't like to use a browser anymore and only use Safari if I really need to, and get frustrated that the web pages are not optimized for the iPad. I believe now, that the future is a retro of the 90es when we had a lot of enterprise applications as client server apps and not running in a web browser. We will again have server client applications. The data might be in the cloud but users will have an app on their tablet. Take as an example CRMs like salesforce. It is in the cloud and has a web interface. It is great for an user, you never need to care if you have the latest version. But SF has as well a mobile access and most of the sales people are on the road and not always on their notebook. Sales people are the perfect fit for tablets like iPads. They don't need a heavy powerful notebook. They mostly using email, word, PowerPoint, a little Excel and a CRM. The iPad can do all this. I can see many companies to switch to tablets for their sales people. They are lighter ad cheaper. 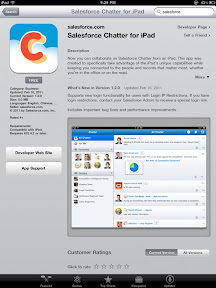 Right now SF has only chatter available as iPad app. But I am pretty sure there will be soon a full SF version as iPad app. You might ask, why not using the web browser? You think the screen is big enough to use a browser. True. But apps are optimized for the device and have many times much better UI. 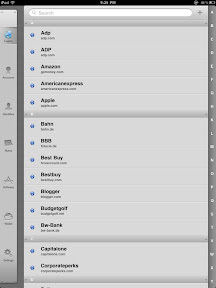 Even chatter looks ten times better on iPad then in the web browsed. And then we might forget why an app is so much more convenient. The app sits as icon in front of you (website short cut could too) and the app can store basic settings and information which the browser does not. It is so easier to log into an application instead into a website login. Even if you save your login in browser, depending on the firewall or your computer settings, you have still to login. I have now so many user names and passwords that I always forget the access when I need it. I could use 1password app, but companies are always changing their login page that 1password for log in not always work. Yes Apple changed my life, that I almost only use Apple (I use Windows work related). And Apple changed my life that I like to have apps instead using web browsers. Tablets are the future. It does not matter if Androids, Windows or iOS, all of them will replace notebooks. Power users will have desktops and tablets in 2015 and all others smart phones or tablets which are connected to big screens and external keyboards. There will be no CD or DVD drives anymore, because we download apps we need. And we will use the browser only, if we there is no app for what we want to do. Browser will not die but not play such big role in 2015. Every e-commerce site will have their own app. And then there will be an app for all big e-commerce sites that we don't need to have too many apps on our device. We are in the year of the cloud. The tablets apps will be in the future much smaller in size, because we only store minimum information on our device and the rest is in the cloud. The apps will be stupid shells with perfect UI. This will allow us to have hundreds of apps on our device. Today I have on the iPad 92 applications. I never scroll the screen to find them. I use the search and type what I am looking for. It is so convenient that I almost forget how it used to be just 18 months ago. Commodore is back, 28 years after I bought my first C64. 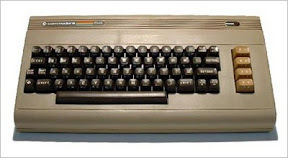 The guy who bought commodore is producing the C64 again. Same look with new technology. The computer comes with Linux and a 64 emulator. Maybe you might want to buy one. Is the Apple TV dead? Time to complain about iWork Numbers on the iPad. What makes Apple so successful? 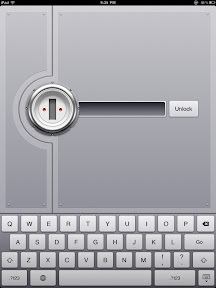 New iPhone iOS preview or Fake? What is the right social network? What is going on with Facebook? Where is Windows in the mobile world?